“We look at Omega Point every morning before the open. Once we upload our portfolio into Omega Point, I spend time before the open looking at what's our overall idiosyncratic factor risk. Peeling back further, how has that broken down? How has that changed since yesterday? How are new potential additions to the portfolio or the scaling in and out of positions going to impact those various factor risk metrics? It's part and parcel of our daily process." Boston-based long/short asset manager Garelick Capital Partners (GCP) experienced significant shortcomings with the platforms it had been using to manage factor exposure in its growing investment portfolio. In 2016, GCP initiated an extensive search to find a more sophisticated and robust solution that better fit its needs. 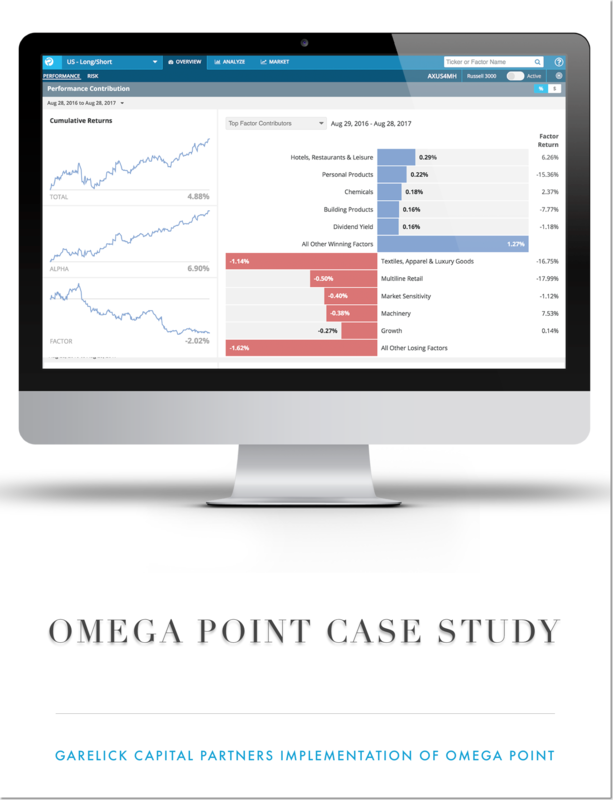 After thoroughly evaluating several platforms, GCP ultimately chose to implement the Omega Point Market AwareTM portfolio intelligence platform. In this candid case study, Bruce Garelick, GCP's Founder and Chief Portfolio Manager, provides a seasoned buy-side practitioner's perspective on the critical role that factor exposure management plays towards executing a successful investment strategy. He explains the essential attributes that GCP needs in a risk management platform and illustrates potential pitfalls all asset managers need to avoid. Finally, he shares an in-depth perspective based on his hands-on experience using Omega Point and explains how it helps contribute to GCP's success.